During the construction of a private house, every future owner hopes that his home will serve for several centuries, giving his warmth to his children and grandchildren without major repairs. Unfortunately, this is not possible, but in time carried out competent repair and maintenance during operation will maximize the service life of the structure. 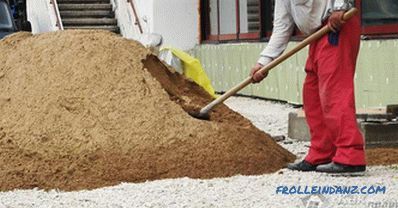 One of the most important skills you need to acquire is how to properly make a blind area of ​​the house foundation. The blind area is a structure that is designed for removal of rainwater or other water from the base of the house. Not to be confused with waterproofing, because they are completely different things. 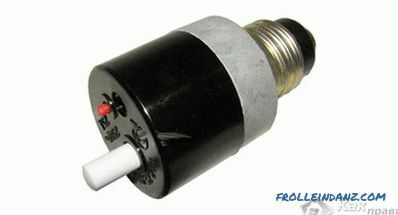 It is designed to enclose a waterproofing, thereby enhancing its functional and operational qualities. By diverting water from the surface, the pressure on the waterproofing located below ground level is reduced. 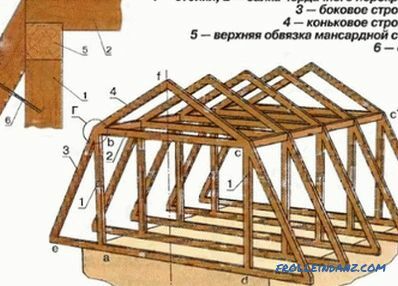 Thus, the durability of both the foundation itself and the building itself increases. The blind area is made around the house with a minimum width of 80 cm. The more it is, the better the discharge of atmospheric moisture will be carried out. Having determined the dimensions, make a marking and remove a layer of top soil about 20 cm thick. This is necessary in order to get rid of the remains of plants, roots and seeds, which will have a destructive effect on the concrete. If possible, call the specialists who will treat the pesticides that prevent plant growth. However, this procedure is not required. When removing the soil layer, try to make a slight slope in the direction of understating the surrounding area. 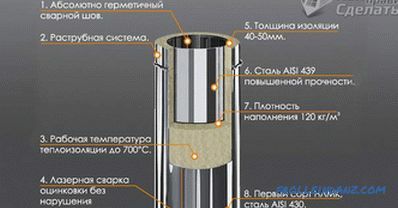 The best option is the device drainage system on the outer edge, which completely eliminates the interaction of groundwater with the base of the building. The design provides for the underlying layer and the coating. The litter is made of a clay moisture-proof layer that fits into the prepared pit, followed by a thorough tamping. The role of the coating is played by a concrete or asphalt layer with a thickness of 10 cm. For the manufacture of blind areas, crushed stone, gravel, brick fragments and construction debris are used. 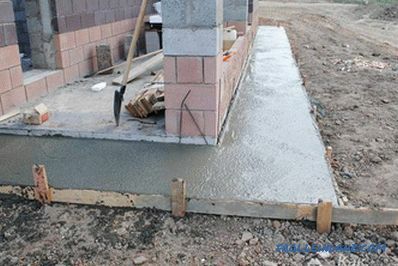 All components are carefully rammed, and then poured over with a solution of cement. When pouring the coating, it is necessary to install separating bars that are pre-impregnated with oil and treated with bitumen. 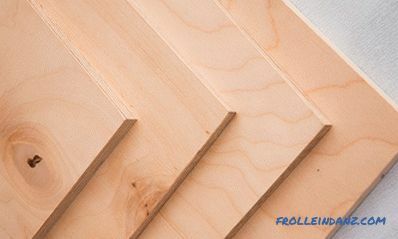 Otherwise, the coating will be covered with cracks when frost occurs, and the slats will prevent it. Reiki are located in steps from 1.5 to 3 meters . To increase the strength of the concrete layer, it is necessary to fill it with dry cement and wipe with a trowel until the concrete grabs. 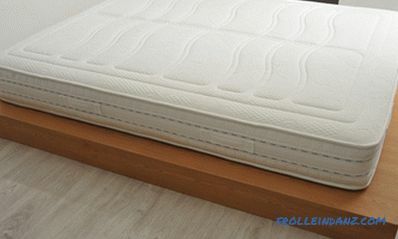 The design can be varied, the only condition that must be met is watertightness. In order to blind blind performed not only a protective, but also a decorative role, it can be made of sand. Sand poured into a trench, pour it with liquid glass and hardener. This makes the surface very hard and durable. 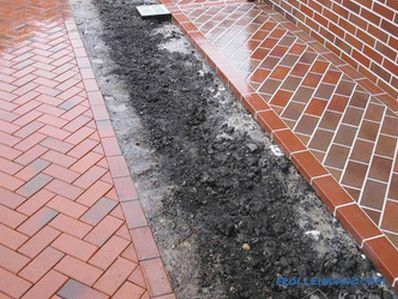 This coating will protect the foundation from moisture penetration and decorate the landscape with its appearance. You can buy a ready-made solution at a specialty store, or a semi-finished product that requires cooking. During times of lack of cement, the blind area was successfully made of sod. 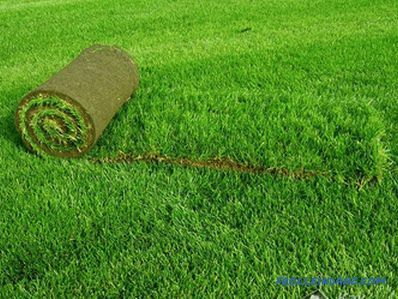 To do this, you will need to do the following: remove a half-meter layer of soil around the perimeter, compact the soil and build a drainage system of coarse sand. 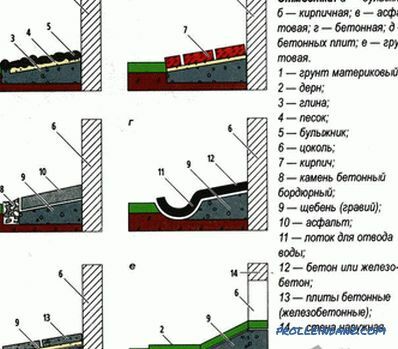 Next, it is necessary to fill the clay layer with subsequent tamping and the formation of an inclined water flow. After that, you will need to lay fertile soil and meadow sod. For some time, it must be moistened and trimmed to form an elastic turf, not amenable to blurring. Such a green structure looks more attractive than a concrete one, sometimes it is impossible to guess what is under it. Main functionality of the blind area - protection of a residential building from the negative impact of rain and surface water, and the technical solution of the design is determined by your preferences and the surrounding landscape. This structure needs to be constantly monitored, since the emerging cracks break the tightness and must be sealed with a solution of cement. 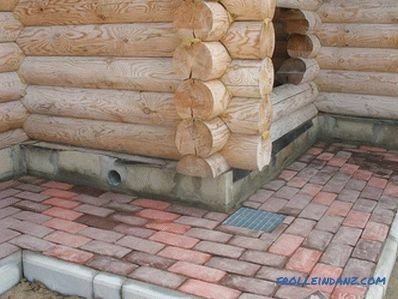 In case of separation from the foundation, use sealants to fill the space.This will help you not only increase the durability of the structure, but also to preserve its aesthetic appearance. When installing, you should strictly observe the main technological requirements.